"It has opened up new possibilities which I hadn't thought of or known much about." 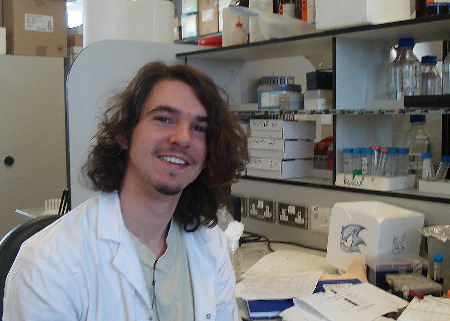 In summer 2008, Dave Catton joined Dr Alicia Hidalgo's research group at the School of Biosciences, University of Birmingham to work on the project 'Control of cell number in the brain of the fruit-fly Drosophila'. The Hidalgo lab is currently investigating what genes and molecules drive the emergence of nervous system structure during development. As well as addressing a fundamental question in biology, understanding this will also help us understand how the brain responds to injury and disease and how we can promote its repair. Dave looked at the structure of the normal larval and adult Drosophila brain, using markers to visualise axonal bundles and dyes to see all the nuclei. This allowed him to see that cell density changes in different brain modules. Dave then looked at the structure of the brain in mutants to look for differences between the normal and mutant brains. Although it was not possible to detect any definite differences, the techniques and analysis used were improved, and this will help the group in the pursuit of this project. 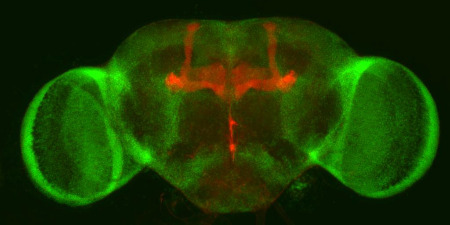 Dave learned several techniques, including the use of a laser scanning confocal microscope and he produced stunning images and 3D reconstruction and animation videos. "The bursary provided me with an opportunity which I would have otherwise been unable to experience. It has proved to be a very rewarding, enjoyable and beneficial experience which I owe to both the bursary and to Dr Hidalgo. It has given me an insight into what a PhD would involve and has increased my desire to get a job in science. I have learnt a lot, and not just scientific facts and methods, but about the way science works and what other people in the lab do. I have learnt skills that can be added to my CV and that will be beneficial to my studies, and I feel my understanding in biology has deepened."